As part of my attempt to update my closet so that it reflects my current life and the person I am now instead the person I was four+ years ago, I’m wearing certain pieces one last time to determine if they have a place in my new lifestyle. 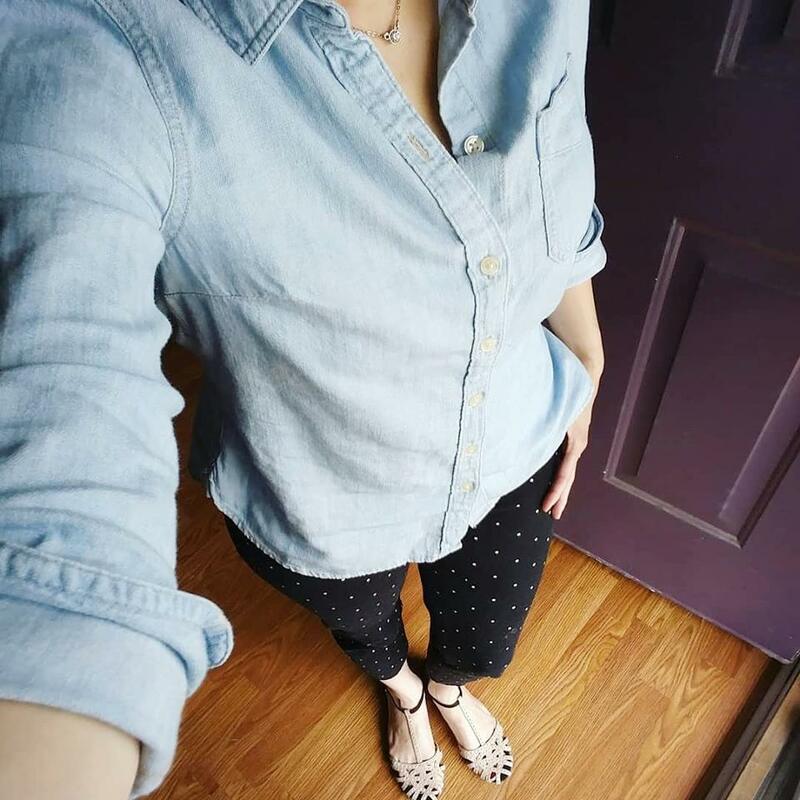 This navy and white polka dot skirt is one of those pieces that I liked but I wasn’t wearing; it hung in my closet for several years, every day getting passed over. So, it’s on the chopping block; I’m wearing it today to decide whether I keep it or donate it, and I decided to recreate/update an outfit I’ve worn before with this skirt. Since I’ve started staying home with Sebastian, it’s become really easy easy for me to “forget” to change out of my pajamas and wear them all day long. Other things I sometimes forgot to do: brush my hair, shower, and brush my teeth. The first two weeks weren’t pretty, people! But, at least my messy bun was on point! It’s not that I forgot to do these things, really, but I was preoccupied with figuring out this whole stay-at-home mom thing. What am I supposed to be doing? What is Sebastian supposed to be doing? It wasn’t as easy as I had imagined. Luckily, it didn’t take us long to settle in and create a routine. We’ve established regular nap, meal, and play times so our day is pretty predictable. We also went through a major overhaul in January and cleaned out a lot of drawers, closets, and rooms in our attempt to minimize the clutter in our lives, so now my house stays cleaner longer. Although, it’s almost time to do this again. 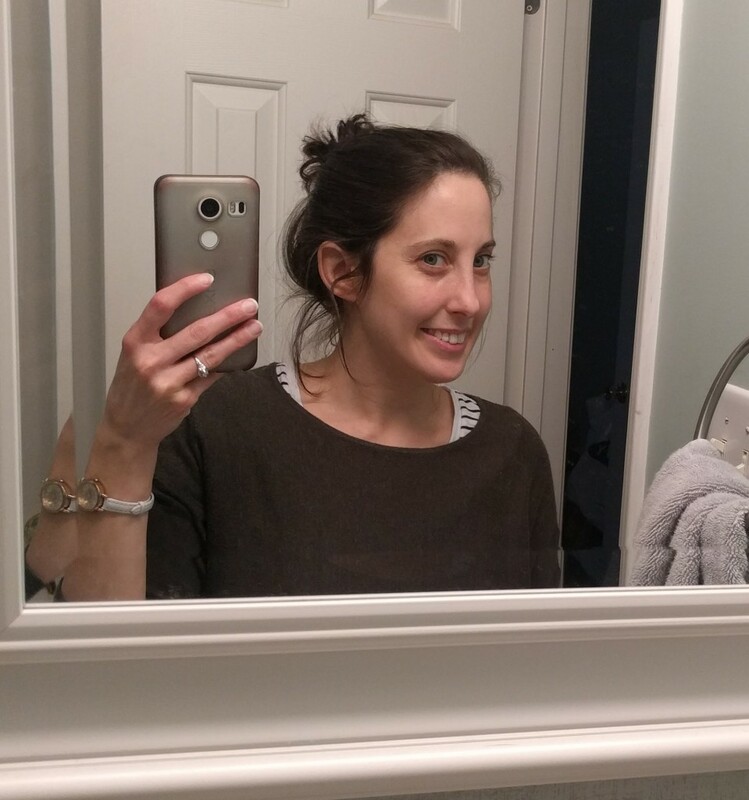 Most importantly, I don’t feel like I have to use the few precious hours of nap time for cleaning; I can use it showering, getting dressed, and blogging (it does feel good to be back!). All that to say I’m back to putting together cute outfits to share with you, dear friends. 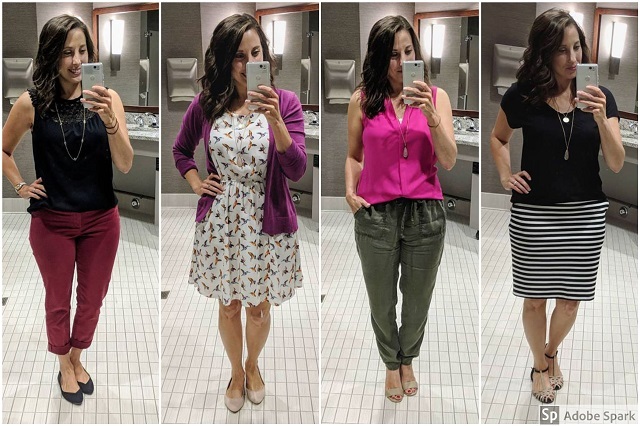 Here’s a compilation of outfits I’ve been wearing lately. These first two outfits were worn to meet Nick for lunch and then run errands. 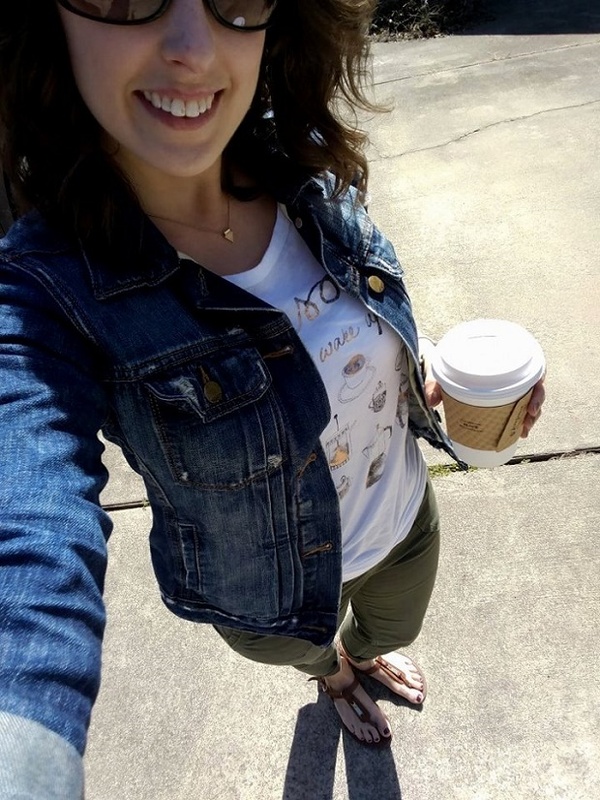 I’m so glad it’s finally Spring and I can wear cute outfits again! This next outfit was simply worn around my house, playing with Sebastian. It’s pretty comfy, especially barefoot. I wore this one out with friends for drinks. It was a beautiful evening so we met up at Bull City Cider works with our kids (they have a son the same age as Sebastian) and enjoyed the warm sun and cold hard cider. It was a great day. In Durham, where I live, breweries and bottle shops are very dog and family friendly. Most of the breweries have areas separate from the bar where parents can gather with their friends and kids to have a beer and play a few board games. Some of them even have nice outdoor spaces where kids can run around while parents hang out with their pals. I’m thankful for this because it allows Nick and me to go out for a drink last-minute without having to find a babysitter. And after a ridiculously long week, that’s exactly what we did. We headed to a small bottle shop near our house with Sebastian in tow. And this is the outfit I wore! We weren’t out for very long, maybe an hour at most. I had one glass of wine, and Sebastian slept most of the time so I don’t feel bad about it. 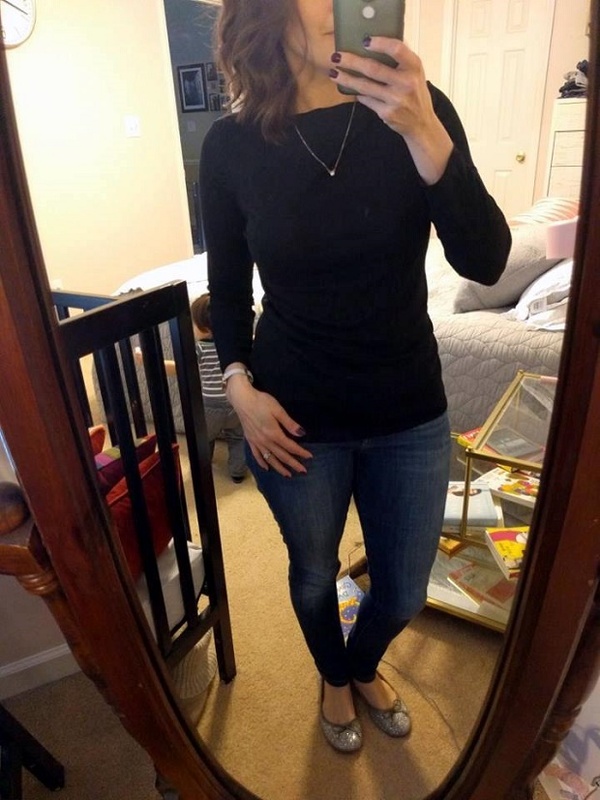 But I did want to feel like I was actually going out instead of having a drink at home in my pajamas so I grabbed this new pair of jeans I got from a recent Stitch Fix. 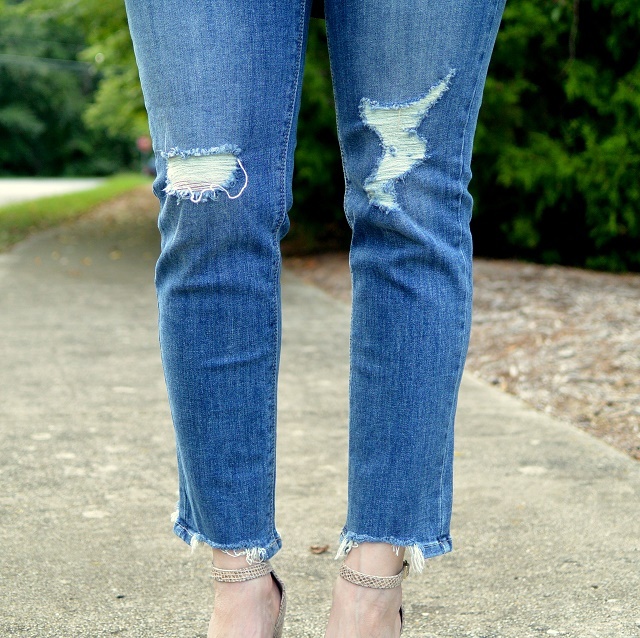 I wasn’t sure how I would feel about the frayed hemline of these jeans but I slowly warmed up to them. 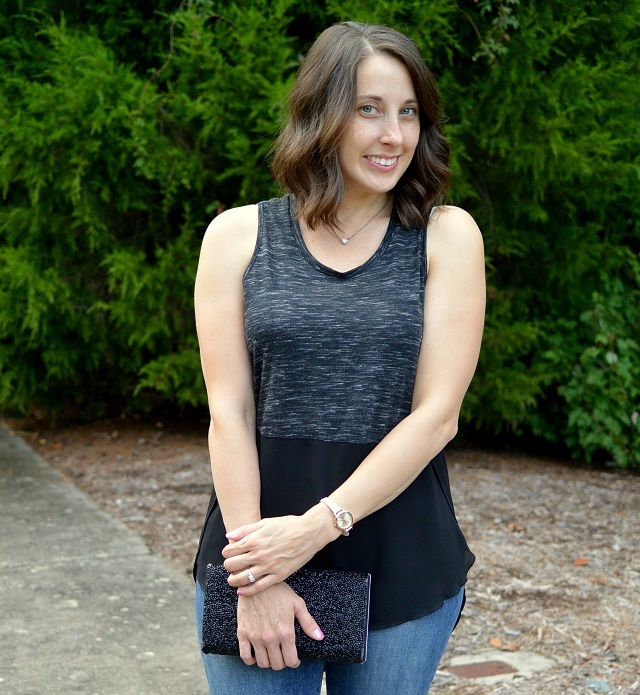 While these may not be the first pair of jeans I reach for, I definitely wear them a bunch. And I will probably wear them even more now that the weather is starting to cool down ever so slightly. A few weeks after Nick, Sebastian, and I went to the bottle shop together, we met up at the bottle shop with our neighbors who have a kid who is slightly older than Sebastian. It was a fun time all around. I’m sure the bottle shop won’t be the last crazy place we take our baby. Where’s the craziest place you’ve taken your baby? 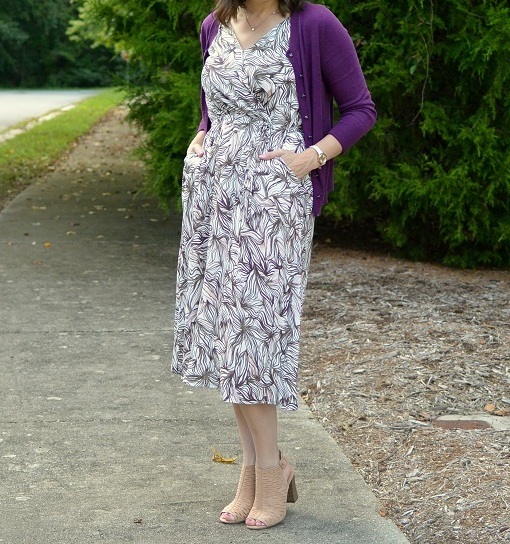 I’m taking a break from the rain and gloom of today by sharing with you an outfit that I wore last week when we still had some beautiful sunshine. 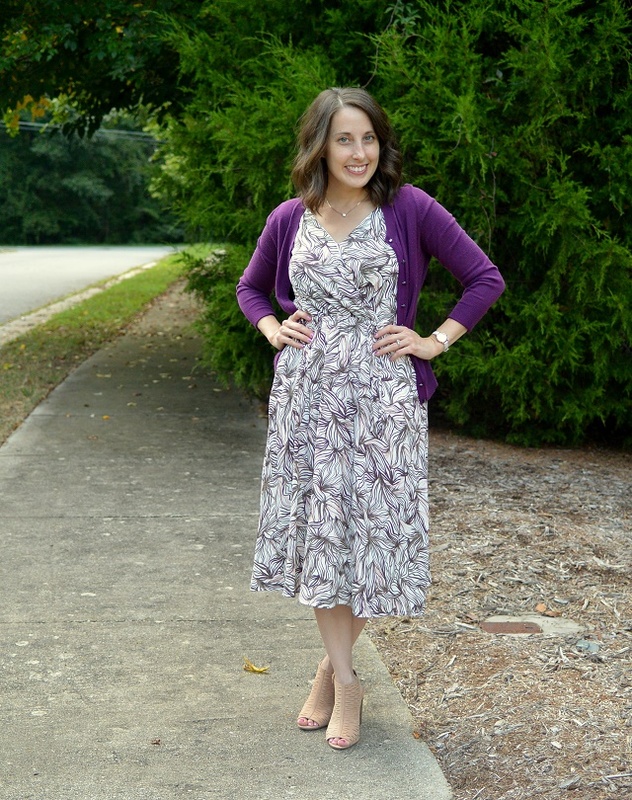 I picked up this faux wrap dress from Target as the Mossimo brand is being fizzled out. It has a satin weave and a breezy silhouette, giving it a style that is perfect to take me from a casual day or the office to fancy formal events. If it were the weekend, I would’ve kept it simple by pairing it with sandals, but since I wore it to the office, I decided to dress it up by slipping on my new open-toe booties. 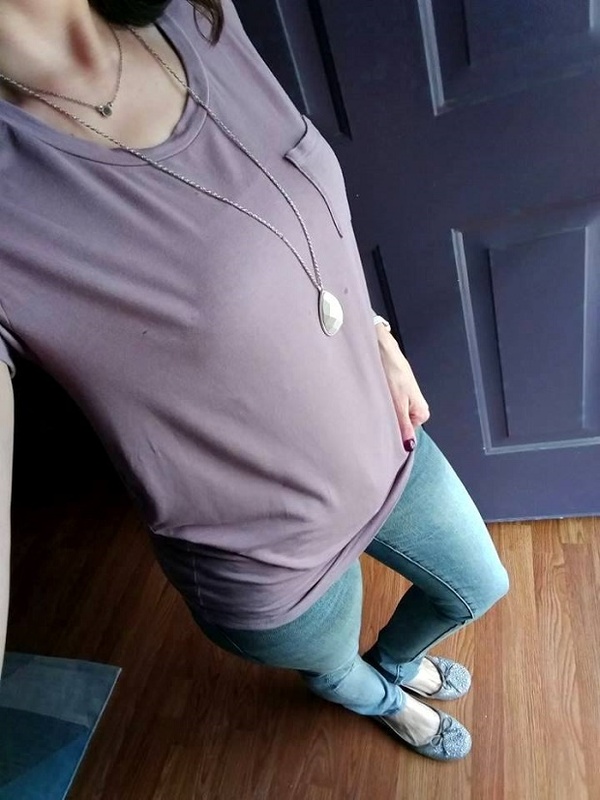 I love the pink and olive colors. 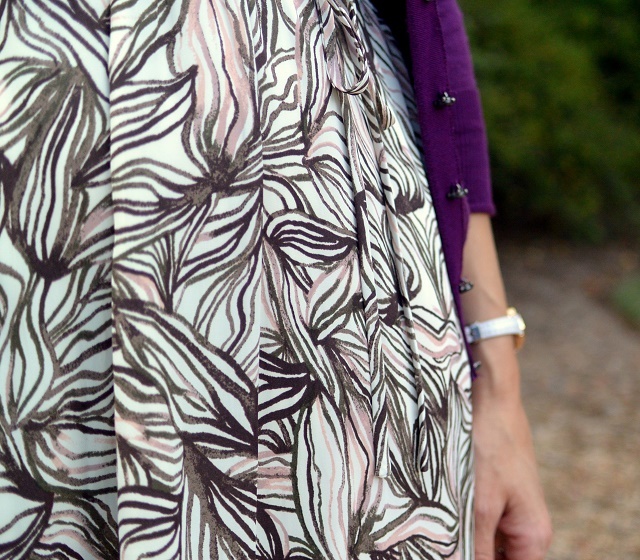 For some reason, the colors, pattern and style of this dress reminds me of Miami. I’ve only been there once and I wasn’t really paying much attention to what folks were wearing, but it’s definitely what I picture Miami ladies wearing. Maybe I’m just imagining things! Real talk: I had this dress altered for a better fit. I asked to shorten both the shoulders and the bottom hem of the dress and I think it turned out pretty well. However, there is a snap in the front that allows you to choose how deep you want the front V to go. I love this feature but since having the shoulders altered, it’s very easy to snap open with even the slightest pull so I have to be careful, especially while at work! Next time I’ll wear a thin cami underneath, just in case.